BOTTOM LINE: A blindfolded and mostly immersive take on Macbeth that relies on your senses to weave a tale of murder, paranoia, and revenge. It’s often said that the beauty of Shakespeare is in the musicality of his language —that the way in which he formed the very words that escape the mouths of his characters paint images, provide extra context, and even evoke emotions from his audience. Imagine then, if you were invited to observe a production of one of his most famous plays, Macbeth, stripped of your sight, and instead made to rely exclusively on what your other senses are capable of receiving. John Schultz’s entry into the New York International Fringe Festival, Till Birnam Wood…, does just that. Upon entering drom, a dark and intriguing performance space, audience members are instructed to take a seat and prepare to adorn a blindfold given to them earlier. Before the cue is given to do so, the three Weird Sisters, or witches, performing a bit of movement, concealed in black fabric—almost cloaking them in an otherworldly black shadow that moves inhumanly before the audience. The audience is instructed then to put on their blindfolds, and the fun begins. While Till Birnam Wood… is by no means a revolutionary new take on Macbeth, it is a refreshing way to enjoy a piece considerably overdone in the last couple of years. Relying predominately on pre-recorded audio, sound effects that illustrate the action being performed within the plot, and of course the vocal prowess of its eight actors, Till Birnam Wood… manages to control the somewhat frenzied movement of the story without any visual cues. By leaving so much of what we “see” as an audience to the imagination, it in a way creates a very personalized production. I was forced to create what I imagined each character looked like, how they moved through space, how the setting existed, etc. One complaint: while the production utilizes sound and smell, touch is disappointingly completely left out of the equation. In fact, the audience is advised in the pre-curtain speech that the actors will not touch the audience. Schultz has created a piece that seems to challenge your way to view Macbeth, literally and figuratively, and yet with a piece so dark and seemingly dangerous, he never challenges your sense of safety or comfort. While there are certainly creepy moments—any time the witches are present, or the appearance of Banquo’s spirit in the grand dinner scene—the piece misses its mark in truly pushing the envelope in creating a fully immersive experience. 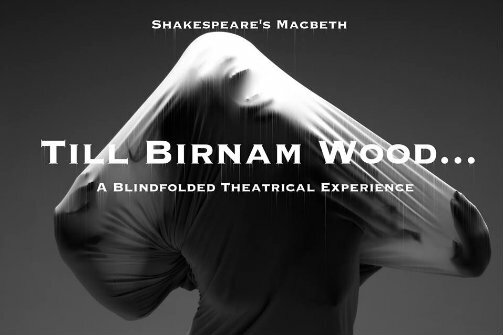 If taking part in a somewhat immersive take on one of Shakespeare’s darkest classics is what you’re after, then Till Birnam Wood… is worth a blindfold. Till Birnam Wood... is by John Schultz, based on William Shakespeare's Macbeth. Directed by John Schultz. Stage Manager is Sam Wend. The cast is Adam R. Deremer, Jenna Kuerzli, Kevin Patrick McGuire, Katherine Perry, Kevin Rodden, Angela Smith, John Schultz, and Jennifer Summerfield.